Earth Watch Club FCC (EWC) held an orientation with The Environment Protection Fund (TEPF) on Wednesday 28 March. TEPF is a non profit organization (NPO) that works for the protection of the environment with the motto ‘Clean, Green Project’. 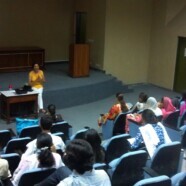 The guest speaker on the session was Zar Aslam, CEO and Founder of TEPF. Zar shared the organizations’s past activities and future plans with the students. This NPO is registered both in Lahore and California and they has been working actively for community service by cleaning up community areas which have turned into waste sites. It has provided a similar chance of social consciousness and community service to students at FCC by this initiative.